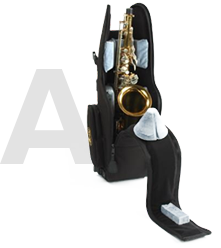 Best protection for your Horn in its weight class. The Mid-bag suspension system in Gard Bags is a protective combination of dense foam pads and cones in Gig Bags and dense foam cubes and cones in Wheelies. It holds the music instrument by its robust parts, leaving the delicate parts suspended in mid-air. 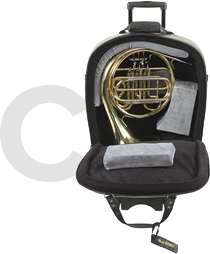 As a result, about 9 out of 10 times, the music instrument will escape damage when dropped or on impact. 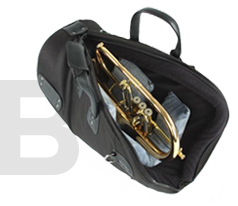 In ordinary bags, the delicate protruding parts of the musical instrument touch the bottom and side walls of the gig bag. In the event of an accidental impact, the delicate protruding parts (1, 2 and 3) are liable to be damaged.